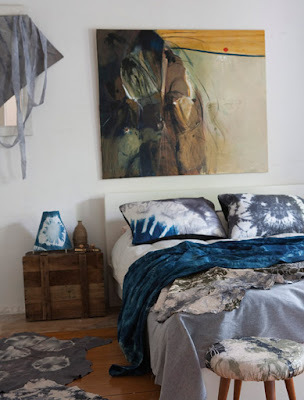 Shibori has been used by the likes of stylists and interior designers Sibella Court, Kerry Phelan and Woods Bagot. It's an Australian company that was set up about six years ago by Karen Davis and Pepa Martin, who met while studying fashion at East Sydney College. 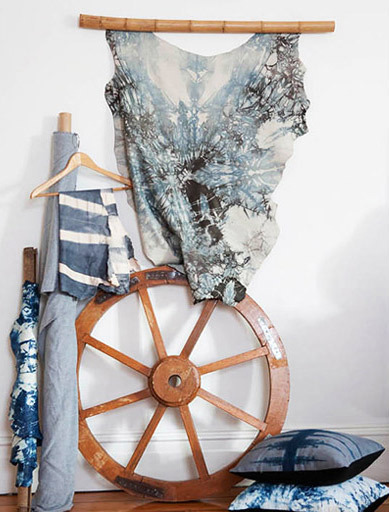 In a relatively short period of time they've gone from working on commissions to producing a book - Shibori in the 21st Century (scheduled for October) - and releasing their own range of fabric dyes. They'll also be hosting a series of workshops at the Powerhouse Museum in November. Karen: Indigo, charcoal, copper, tangerine and turquoise. Pepa: Olive, ochre, burnt orange, caramel and shiraz. How did you get your career start and what path have you taken since? We meet at The Fashion Design Studio at East Sydney College and had an instant connection. We started the business in 2005 and began working with prints (both digital and screen), however we kept coming back to hand dyeing. In 2007 we did our first “Life in Style Trade Show”. It was nerve racking because hand dyeing wasn’t in at that time. We were really worried people might think we were crazy hippies. However, the positive response was overwhelming and gave us the confidence to expand the business. Since then we have focused on creating commission pieces working with interior designers and architects on amazing large-scale pieces that give a space a personally of its own. We have been lucky enough to work with some of the most talented and well-known people in the country and our work can be seen anywhere from corporate spaces (Macquarie Bank Head Office) to large venues (The Beresford upstairs) to many smaller places in between. We are both really passionate about shibori and feel it is our duty to spread the word about other amazing people using this medium. With this in mind comes the creation of our book “Shibori in the 21 Century” which includes interviews and showcases the work of others. We were lucky enough to interview Australians Akira Isogawa, India Flint, Barbara Rogers and other international artists like Trine Mauritz Eriksen and Shabd Simon Alexander to name a few. The book will be launched at the end of this year with an exhibition and workshop by some of the artists. It is truly a dream come to fruition. Karen: To close your ears to the negative opinions of others. Someone somewhere will think what you are doing is crazy and it probably is, however, that doesn’t mean you won’t succeed. Have faith in your own dreams. Pepa: Feel the fear and do it anyway! Karen: 5-metre high by 3-metres wide dip-dyed curtains for Upstairs at The Beresford Hotel. The deadline was very tight and we had to find new and inventive ways to get the job done. It was very intense but lots of fun. 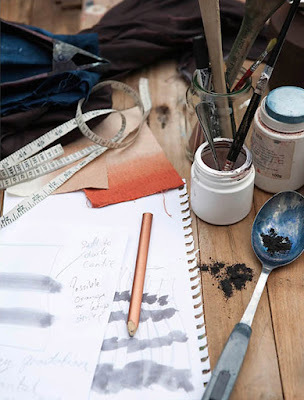 Pepa: The production and development of our dye range “Dye Da Vida” with Tintex Australia. Dye Da Vida translates to dye gives life, which is how we truly feel, and we hope the dye range inspires other to do the same. This in conjunction with our workshops (one to be held at the Powerhouse in October) is my main passion. 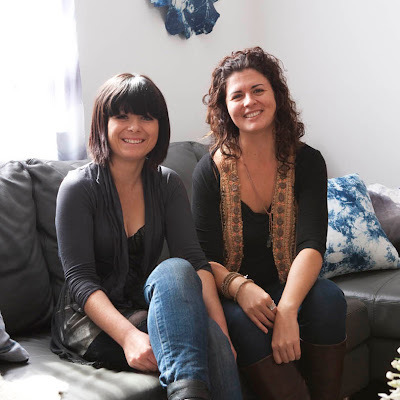 Karen and Pepa: Starting the business. It has been such an amazing ride with personal growth and creativity. Our days are always full of laughter and things are always made easier when you have someone else to bounce things off. Karen: People who are fearless and follow their dreams. Pepa: Mother Nature and the simplest of ideas. Karen: Nothing makes my heart flutter more than a beautiful vintage textile, I get goose bumps just thinking about it. Pepa: Shibori in nature, a mossy sandstone wall, the imprint left after the rain. Interpreting these textures on cloth. Karen: Astro boy - fearless, a bit tragic but with amazing hair. Pepa: Antoni Gaudi, the grand scale of his art, his organic lines I would just like to pick his brain for a bit. 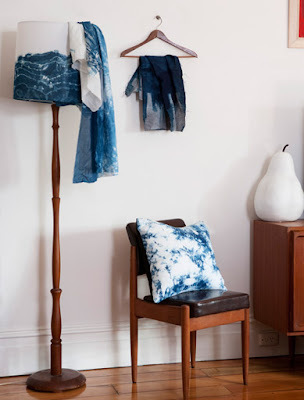 Karen: Finally (finally, finally, finally) seeing the finished product of our book Shibori in the 21st Century. It has been a real labour of love for us (and our very talented and patient designer Steve Clarke). Pepa: An international exhibition, our second book (a dyeing manual). Karen: India Flint’s new book Second Skin. Pepa: Kafka on the shore. I love these pieces! Such talent. I like the line "close your ears to the negative opinions of others" - sometimes need that reminder! Agree, I like the color blend design.